When Jimmy Barry sent out an invite to Bishopstown Hillwalking club to attend his book launch in the Aherlow House Hotel I gladly accepted. It was great to arrive there and see that there were stalls set up not only by the South Eastern Mountain Rescue but also the Glen of Aherlow walking club and members of Mountaineering Ireland. There was a considerably large turn out for the launch and after talking to other walkers we were introduced to a slide show of photographs from the book. 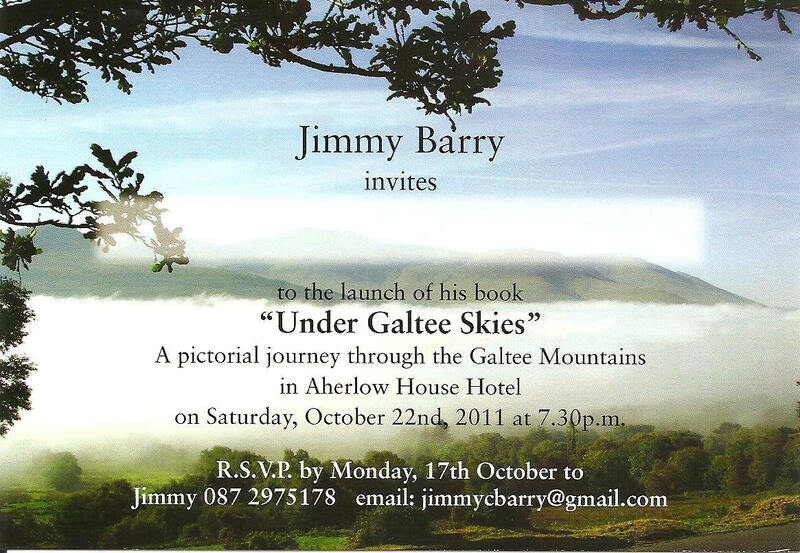 The book titled Under Galtee Skies is a pictorial journay of photographs taken by Jimmy of the Galty mountains over the years. As Bishopstown members have been walking this area for many years there are plenty of photographs of areas we are all familiar with and even though I have walked the Galtees many times myself I have never seen the head/face formation above Bally david wood. Also it was great to read some folklore of the area none of which I knew previously and will now always include when leading walks in these areas. The photographs are spectacular and you can see from the lighting within them that Jimmy definately has a rare eye for a picture, the skies above Galtymore in a picture taken from slievecushnabinnia are such a testiment, as is the lighting in the picture of Assaroola Glen. With a section on flora and fauna along with poems and place names this really is a magical book which I've no doubt all our members will enjoy. The only problem................they sold out of all the hardbacks before I'd even managed to reach it!! This book is not meant as a guide book so don't expect routes and walks, you certainly wouldn't be taking it on the mountain for fear of it getting ruined. If anybody is interested in attaining a copy please contact me at juliereeveswalking@gmail.com and we'll see if we can get some copies.